With fifteen restaurants, eight cookbooks and a host of television shows, including the ever-popular Iron Chef America, Mario Batali is arguably one of the most recognized and respected chefs working in America today. This, combined with his larger-than-life personality is the reason that he has received accolades like GQ Magazine's Man of the Year and the James Beard Award for Outstanding Chef. Mario and his business partner Joe Bastianich own fifteen restaurants across the country including their flagship New York City restaurant Babbo Ristorante e Enoteca, as well as two restaurants in Los Angeles and three in Las Vegas. The duo's latest venture is Tarry Lodge in Port Chester, New York. Mario is also the author of eight cookbooks including the James Beard Award Winning, Molto Italiano: 327 Simple Italian Recipes (Ecco 2005) and the New York Times Bestseller Mario Batali Italian Grill (Ecco 2007). Mario’s newest New York Times Best Seller, Spain…A Culinary Road Trip (Ecco 2008) is the companion book to his prime-time PBS series Spain…On The Road Again. His new highly anticipated eighth cookbook, Molto Gusto, based on the classic and celebrated dishes of Otto Enoteca Pizzeria (Ecco 2010) hit shelves this spring. 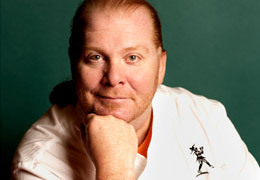 Mario started the Mario Batali Foundation in May of 2008. The mission of the Mario Batali Foundation is to feed, protect, educate, empower children. To learn more Mario’s mission, visit www.mariobatalifoundation.org. 7-INCH MUNNY is BUY-ONE-GET-ONE-FREE in June! Visit the Entries Gallery, and be sure to "like" your MUNNY. Tell others about MUNNY MUNTH and this HUGE CUSTOMIZING CONTEST.